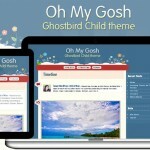 Oh My Gosh is a Ghostbird child theme and is my first publicly released theme. It’s a Tumblr-style WordPress theme, good for microblogging. This post is filed under WordPress Themes. This post is filed under Personal, WordPress and tagged Post formats. Being a fan of WordPress post formats, this latest theme Esquire is one of my favorites. I love the styles for the image and video post formats.